In my humble opinion, one of the most critical features offered in the Brightcove Studio is smart playlists. I also feel that smart playlists are often overlooked and underutilized. I am going to do my best in this post to shed some light on how smart playlists work and how they are best used. Some knowledge of how to build smart playlists is assumed so if smart playlists are new to you, have a look at the general knowledge document here. First off, Smart Playlists have two key purposes. They are for both internal video management and external video publishing and distribution. Let’s take a look at the internal management piece first. As video projects evolve, they tend to become larger and more complex. This means that all of a sudden, you may have many types and categories of video content. How does one make sense of all these various categories within a single Brightcove account? Smart playlists of course! Let’s say you work for a company that makes high quality sprockets. When you first starting using video, all you had was an ‘about us’ video on the homepage of the website to educate potential customers on the merits of this great company. Now your company uses video for everything! Marketing videos, product videos, support videos, investor videos, internal corporate communications and internal training videos just to name a few. How will we ever keep all of this content organized? Step one is developing a straightforward naming convention. For the above example, I would sort all video content by two main categories: content intended for internal viewing just within the company and then all external, public facing content. Every video that gets uploaded should be tagged with either ‘internal’ or ‘external’ to keep the content separated. The next category would probably be describing what type of content the video is specifically. We could have tags like ‘marketing’, ‘product’ and ‘support’. There could be even further classification within these categories. For example, maybe ‘marketing’ is broken out further into ‘PR’, ‘conferences’ and ‘testimonials’. You get the picture. Now it’s time to build some Smart Playlists. Create playlists for all the categories you need. For the internal and external examples, you would most likely set the tag settings to ‘contain one or more’ so you would be gathering all videos that have that tag. For the more specific categories, you can create much more targeted smart playlists. For example, you could create a testimonials playlist that was set to grab only videos that ‘contained all’ tags ‘external’, ‘marketing’ and ‘testimonials’. This playlist would only gather up content that contained all three of the specified tags. Once your naming convention is created, you need only to ensure that all new content is tagged appropriately moving forward and voila, your content will always be neat and organized. So now on to the the second key function of smart playlists and the most important of the two: easy publishing and distributing of your video content. As your video project evolves, so will the amount of places you publish video. In the above example, we started out publishing one video to our homepage and now we have players everywhere. There is a video player on our support page, a video player dedicated to the product section of the website, an internal video portal for corporate communications , a Facebook player and so on. Now when uploading new content, it has become quite a task simply figuring out where all this new content goes. Enter smart playlists. When building out your video players, use smart playlists. Expanding on the example from earlier, you could use most of the categories we have already created. 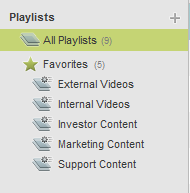 For example, for your video player that sits on your investor page, you need only to add your ‘Investor’ smart playlist. Then, every time a new piece of investor content is uploaded, all that is needed to publish the video is to have the appropriate tags added. Once the ‘investor’ tag is added, the Investor Content smart playlist will collect that video and the video will be automatically added to the Investor player on the website. As you can see, this is a vast improvement of workflow over trying to manually add new videos to the correct players. The other benefit is that you can have videos published to multiple players simultaneously. The act of adding a single tag to a video could publish it on literally hundreds of video players across dozens of domains. As your video project continues to scale, you can see how smart playlists can become an integral part of your work flow. For more information about playlists, have a look here. It can be a matter of preference whether to use the smart playlists versus the manual playlists but typically the more content you are uploading, the more time you could save with an automated publishing work flow.Good luck and happy publishing.